Pontes Maps - Maps, book and prints. Gonzalo Fernández Pontes is an antiquarian bookseller since 1993 specialist in antique maps, prints, sea charts, atlases, manuscripts and travel books from the fifteenth to nineteenth century. Gonzalo Fernández Pontes got a degree in classical history and archeology in 1986. After a period of time working with international archaeological missions in Egypt, Greece and Israel, he founded his own bookshop at Madrid in 1993.He is currently lecturer at the Universidad Complutense de Madrid summer courses talking about antiquarian book trade. IMCOS (International Map Collector Society). You are welcome to our gallery.During these 26 years of professional activity we have helped to create fine private collections of travel books and cartographical atlases.Institutional libraries in Spain and abroad are regular customers of us and we have provided them with rare and unique items. Please, call or email us with your queries. C/ Núñez de Balboa 19, Local 1. 28001 Madrid. 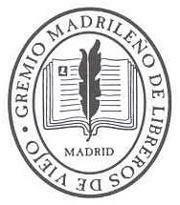 The Guild of Madrid antiquarian booksellers was originally founded in the XVII century when Madrid was court and centre of an intense editorial activity in the mostly known as the "golden age". The Gremio or gild was refounded in the XIX century with booksellers that carried out their commercial activity in the city of Madrid. Nowadays 41 booksellers are member sof this local association, the most important in Spain. Every year the Gremio organizes the "Salon del libro antiguo" at the MIguel Angel hotel,downtown Madrid where local booksellers and colleagues from other cities take the opportunity to exhibit important stuff. Just by registering on Pontesmaps.com you will receive information on a regular basis about new listings and special information from our website before anyone else. Click register and become a member of PontesMaps. Any query or feedback from your side? We will be happy to answer any query about books,maps or views of our stock. If you don´t find an item of your interest in our website, please let us know . Do not hesitate to contact us.We want to receive your comments. Click here to Contact us with your queries. How to find the objects I want to buy for?